Looking to add value to your home, protect your space’s interior, and up your house’s curb appeal? Then it might be time to update your existing roof. But what roofing options are available? A roof, depending on the material, its installation, and the climate in which you live, can last anywhere from ten to 100 years. While the lasting life span of your roof may be short due to how long you’ve had it, other factors, such as storms, structural defects, and lack of sunlight, may mean you need a newer roof sooner than planned. The right roof requires balancing a few options, including the look of your home, the region in which you live, and your overall budget. The latter is especially important as roofs aren’t cheap. 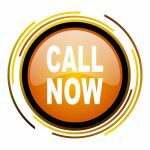 And while you may be swayed to go with the least expensive option available, doing so may require new roofs more often, costing you more money over the life of your home. If you’re planning to stay in your house for years to come, you’re better bet is more likely to select a roof that might be a little higher in cost, but won’t need to be replaced quite as soon. Creating cover overhead comes with options that blend aesthetics with safety and protection. Working with a reputable, certified professional will help you make decisions that meet local building and fire codes, stand up to the elements, match the look and feel of your home, and is a weight your structure can properly support. Here are some popular roofing material options to consider. Look on top of a majority of homes today, and you’re likely to find asphalt shingles. This material is typically guaranteed to last 15-20 years and is very budget-friendly. They come in a wide array of colors, including solid and blended. 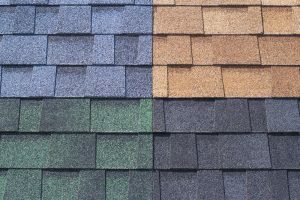 On the lower end of the asphalt option is composition shingles, with architectural shingles being on the higher end. For a little more cost, the architectural shingle is said to last more than 30 years, is more durable, and gives a more designer touch to the roof. Neither composition nor architectural are very eco-friendly, so you’ll need to look for either recycled asphalt shingles or another material when going green. Metal roofs might remind you of old country barns, but they’ve come a long way and are now a great option for residential homes. Made from aluminum copper, alloy strips, or the more popular steel, this fire-resistant material requires little maintenance and can last beyond 50 years. The metal surface helps to reflect the sun’s rays, adding an energy efficient bonus, and is fully recyclable, so it’s good for the environment, too. However, durability and efficiency come at a cost, with metal being pretty pricey. Also, a metal roof could be more of an eye sore for the neighborhood if not paired with the proper style of home. If you love a home with a natural look, than wood shingles and shakes just might catch your eye. 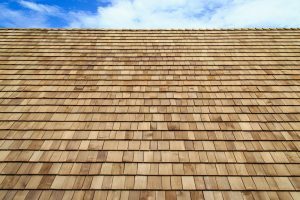 Often made from Western Red Cedar, Eastern White Cedar, or Alaskan Yellow Cedar, wood shingles and shakes offer a look that is hard to duplicate from house to house. When properly maintained, wood roofs can last more than 30 years. And with upgraded products in recent years, this material is fire, rot, and moisture resistant. Cost is higher with this option, and more maintenance is required, such as washing away mildew and mold followed by re-oiling with a finishing product. Tiles made from clay–which are then fired in a high-temperature kiln–and concrete–made from cement mixed with salt and water–are both long-lasting options. Clay can often last more than 100 years, while cement can last up to 50 years. Both require little maintenance but come at a heavier weight, which may require extra support added to your home’s structure. They offer excellent noise prevention and energy efficiency, but can come with a slightly higher price tag, and may be more prone to chipping and cracking over time. Similar to clay tiles, slate (a type of natural stone) roofing lasts the lifetime of a home and is a beautiful option for enhancing the design of a home. It too comes with a higher price tag, and its heavy weight may require additional structural support. Natural color tiles can be laid out in a various patterns offering a unique look, but tile are easily breakable, requiring a skilled professional to install and do repairs. Homeowners in the Chicago North Shore area need roofs that not only fit within their budgets, but that are also built to withstand the rigors of all Chicago and North Shore’s four seasons. Red’s Roofing specializes in full roof replacement and roofing repairs for residential roofing, and we are experienced with all types of roofing materials and repairs. Posted in Posts, Roof Replacement.